From construction cleanup to manufacturing facilities, the Advance Proterra is perfectly suited for all industrial sweeping needs. It is ideal because it is equipped with a large cleaning path, high capacity hopper, and it is easy to maneuver, making quick work out of sweeping a large facility. The Clear-View™ sight line allows the operator to see crucial sweep areas, it works with the user-friendly operator interface system to make hours of sweeping comfortable and safe. 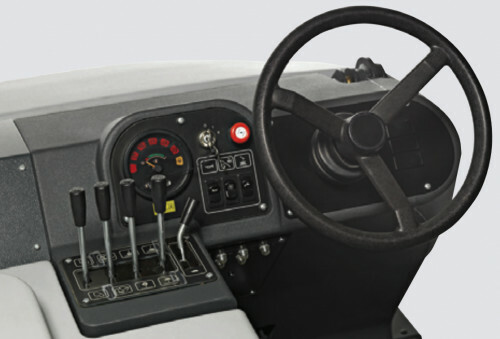 The Proterra includes the unique DustClear™ Five-stage Control System. Part of that system is DustGuard™ which controls dust at the side brooms. It creates a fog around the side brooms, where dust is the worst. This provides the Proterra with a sweep path that is 75% more effective than its competitor. 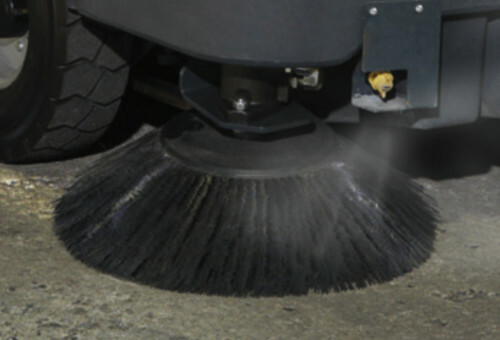 With the Proterra’s DustClear™ System, advanced safety features, user-friendly operation, inexpensive maintenance, and maximized productivity it serves all industrial sweeping needs. Dust control is one of the most important functions of a good industrial floor sweeper. Without dust control, dirt becomes airborne and free to land throughout your facility and your products. Poor dust control also creates a air quality problem for your employees. Advance incorporates great dust control features into all their sweepers. Take a detailed look into DustGuard™ and DustClear™. 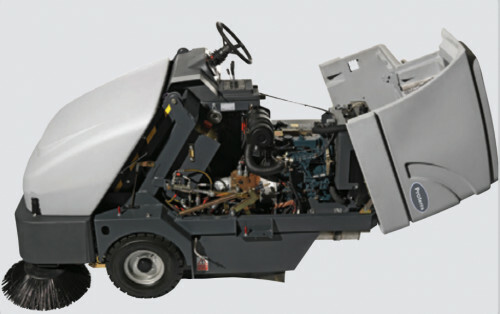 The Proterra hopper can be raised to a height of 62", making it easy to dump debris directly into a waste receptacle while the operator remains seated. The hopper assembly can hold 11 cubic feet of debris. 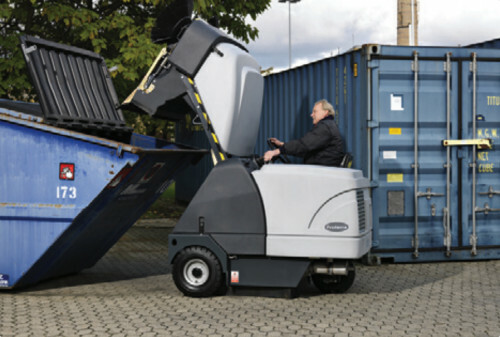 The Proterra hopper is easy to position for dumping since the machine is a forward throw design. Advance designs equipment to be both easy to use and easy to maintain. The MaxAccess™ design provides easy access to all components that require maintenance. Their tools free philosophy enables the operator to provide routine maintenance quickly and easily. The Proterra operator controls are very easy to use and require minimal training. All levers and buttons have icons that are very intuitive and the controls are placed in ergonomic locations. Weight - Engine Powered 2,083 Lbs. Weight - Battery Powered 3,140 Lbs.